Information on transit, taxi service, and directions to and around UBC is available as a downloadable document for your convenience (PDF). 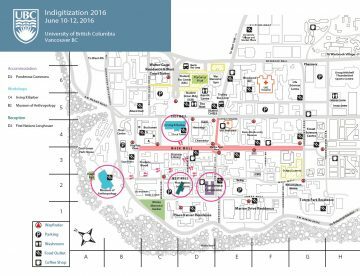 For more information on Wayfinding at UBC please visit http://www.maps.ubc.ca/PROD/index.php. This walking map is also available to download as a PDF. Only U Café All day breakfast: Eggs, sausages, pancakes, hot sandwiches, etc. Address Ponderosa Commons 6488 University Blvd. WhiteSpot Triple O’s’ Tuesday Specials: $3.69 Original Burger, liquor license. There will be a brochure with more food information provided on the Monday. For more information on dining options please feel free to peruse UBC Food Services http://www.food.ubc.ca. For more information on expected costs, please see the application guidelines. Details will be finalized closer to the date. Training dates for 2019: Monday, May 13 (9:30am start) to Thursday, May 16 (finished at noon).